Our neighborhood is filled with people of all backgrounds and experiences. The West End Blogger was created to inspire an exchange of great information and/or op eds on a variety of topics only your neighborhood of unique residents can offer. Guest "neighborhood bloggers" will be featured each month. Check back regularly for the latest entry. Approximately 200 trees have been planted in our neighborhood since the first RGNA Tree Project initiative in the fall of 2012. It is wonderful to see so many young trees along our streets. Our efforts were featured in a Morning Call article in 2013 and more recently in a WFMZ Channel 69 story last May. We have been approached by several interested parties who would like to organize similar programs in other neighborhoods. We are starting our fourth planting initiative for this fall. Orders are due by September 19th. The flyer is available at [WEBSITE LINK]. Additional information is available under the Parks and Garden web page and in the RGNA Blog. 1. Contact David Walker directly at (570) 657-6302. 2. Complete the RGNA Tree Initiative form available on the RGNA website or call Becky Bowen at (610) 434-4396 to have their name placed on a list to be contacted by David Walker, who will then call home owners to take an order or to schedule an appointment to visit the property and discuss options with neighbors. 3. The third way individuals may become involved is through Rick Howells, Tree Inspector for the City of Allentown, who may contact some neighbors directly regarding the need to replace trees along a city street. Act now to replant the missing trees along our streets! We have enjoyed the majestic trees in our neighborhood for many years. They are the result of the action taken by others 80 to 100 years ago. Take action to help restore the beauty of our neighborhood! The following native trees and shrubs are suggested for a windscreen planting at the west end of the Rose Garden (just west of Greek sculpture) to help protect the roses from the windburn they are increasingly experiencing, according to the City Parks Department, since the trees in that area have been lost over recent years to severe storms. This area is approximately 4,750 square feet (95’ x 50’) with the longer dimension running north - south. The use of native plants in the design is especially warranted since Allentown has been designated an Audubon Bird Town (the first Pennsylvania city to carry the designation, awarded in 2011); having been so, the City bears a special responsibility, indeed is privileged, to use native plantings whenever possible to provide bird and other wildlife benefit (especially critical is that benefit native plants provide in harboring the native insect species that are a critical food source required by a majority of bird species). Trees selected include a mix of coniferous and deciduous species that can tolerate the alkaline conditions of our area and are of limited height – attaining an average of 15 to 25 (30) feet - which will be far less prone to “blow-downs’ during storms than would be taller trees. The few shrubs selected will reach 10 to 15 (rarely 20) feet at maturity. Among the shrubs, three native rose species have been chosen as border plants readily viewable along the east and south (leeward) sides of the windscreen in the hope that they will be acceptable as a suitable transition in keeping with the rose garden theme as visitors pass by the informal windscreen area in entering or exiting the formal Rose Garden area. The draft plan shows the plantings in a staggered, slightly loose conformation which allows the wind to be slowed as it’s redirected through the plantings, a scheme supported by the latest research which demonstrates the former habit of using a single, dense row of conifers as a windscreen creates a higher probability of blow-downs as strong winds buffet a seemingly resistant wall of plants which encourages winds to whip around the screen edges in a still forceful manner, free to cause damage beyond. The plan includes an eight to ten (8 to 10)-foot wide grass buffer along the north side of the walking path (west of the Greek sculpture) and a three (3)-foot wide grass buffer at the base of the slopes along the north and west (windward) sides of the planting area for aesthetics and also - perhaps more importantly - to promote safety for both park staff and visitors during the necessary management of the area. Substitiutes may include bladdernut (Staphylea trifolia), hawthorn (Crateagus spp.) if any of the above are unavailable. Substitiutes may include choke cherry (Prunus virginiana), wild plum (P. americana), spicebush (Lindera benzoin) if any of the above are unavailable. The RGNA Tree Project was in full swing on October 29th when Sandy struck our area. After three days of planting 14 trees, we were forced to take a break until the hurricane passed. Several homeowners scrambled to stake the new trees to protect them from the storm. One week later, while the sound of chainsaws marked the death knell for too many more of our beautiful old trees, David Walker, of Walker's Tree Farm, resumed planting the rest of the trees ordered for our project. We planted a total of 48 new trees that now line many of our streets. The first planting is the result of a partnership among the Rose Garden Neighborhood Association (RGNA), the Allentown Parks and Recreation Department, and Walker's Tree Farm. City arborists Rick Howells and Rick Holtzman helped us understand the requirements for planting trees on the verge (grassy area between the sidewalk and curb), made recommendations about what species to plant, visited the Walker Tree Farm to assess the overall quality and health of the trees, issued a group permit, and coordinated the PA1 calls for each property involved in the effort. They also worked with many neighbors to assess the health of trees and to recommend appropriate steps to remove hazardous trees. The Walker Tree Farm provided installed trees at an incredible price. We estimate that neighbors saved up to 50% of the regular cost for an installed tree. A 2" - 2.5" caliper Autumn Sunset Maple will cost less than $200. David Walker met with neighbors to determine home owners' needs and preferences and to help place trees along the verge or in the yard. Later he would return to plant the trees. It was another storm one year ago that prompted the Park and Garden Committee to initiate the RGNA Tree Project. After counting 33 felled trees by early March, we decided to take action. The RGNA Steering Committee endorsed the project wholeheartedly, and on March 22nd, at the general meeting, we started discussing the Tree Project. By the end of the summer we had negotiated a great price for trees to be supplied by the Walker Tree Farm, a 100 year old tree farm located in Lehighton. We had to wait until the first frost, when the trees go dormant and it is safe to transplant them. The first Tree Project planting started on October 24. The result: many excited and happy neighbors marked the beginning of our reforestation effort. Overall, nineteen households participated in the project. Several varieties of trees were planted in the verges, including maples (Legacy Sugar Maples, October Glories, Autumn Radiance, Red Sunset, and Sun Valley); oaks (Pin Oaks and Red Oaks). Several other varieties, including Dogwoods and a Norway Fir, were planted in yards. Most trees were 2 - 2.5" caliper, although several owners selected larger trees for greater impact. Other RGNA neighbors have planted trees independent of our project over the course of the planting season and we want to thank them for their efforts to reforest our neighborhood. We encourage you to consider planting trees and to pursue an option that works well for you. One more group deserves recognition - the volunteers (our neighbors) who worked to make this happen. For every cluster of new trees you see, there is a neighbor who coordinated the effort. Another group of volunteers worked on the tree survey conducted this summer. And a third group coordinated the overall project. If you believe this is an important objective for our neighborhood and have some time to help talk to neighbors and spread the word, contact Becky Bowen via e-mail at: jbbowen@enter.net or by phone at: (610) 434-4396. Given the success of this first initiative, we will continue to promote the RGNA Tree Project as long as there is enough interest in planting trees and volunteers to help make it happen. We already have requests for the Spring 2013 planting. If there are 10 - 12 trees to plant, David Walker is willing to make the trip to Allentown. We will begin to distribute information in the next few weeks asking homeowners to consider replanting trees along the streets or in their yards. If you have been thinking of replanting, this is an opportunity to take action. We have tried to make the process as simple as possible and have obtained great prices on healthy trees. All you have to do is sign up by February 1, 2013. Your name and contact information will be given to David Walker, who will contact you to arrange a consultation at your house and help you decide what to plant and where to plant it. You may place an order with David or you can take a trip up to the farm to select and tag your own trees. (The Walker Tree Farm is about 20 minutes north of Allentown.) Planting will begin as early as the soil is workable at the end of March or beginning of April. You may sign up at the RGNA General Meeting on November 13th or by returning a Tree Project Spring Sign-up flyer to one of several volunteers working on this project. Additional information may be obtained on the RGNA website at: www.rosegarden-na.org. You may read prior blogs or look for links under the Park and Garden web page. Walker's Tree Farm contact information is: (610) 379-5658 or (570) 657-6302. As I walked down Chew Street on a recent morning I watched as an old Norway Maple on Main Street was being taken down. Along the verge, three new Legacy Sugar Maples had already been planted. This is a good example of how we can manage the trees in our neighborhood. Where there are 80 to 100 year-old trees, we need to think about renewal. At what point do we start planting new trees to take their place? Health assessments by an arborist can help owners make a decision about the best time to replant. We need to manage our forest. We have lost too much of our green canopy and we need to take action now to prevent it from getting worse. We need to act to preserve the beauty of our neighborhood. Fall is a great time to plant trees and we are ready to move forward with the RGNA reforestation effort. We have made an arrangement with Walker's Tree Farm, located near Lehighton, to provide the service. If you are interested in planting a tree this fall or next spring, all you have to do is contact David Walker at (570) 657-6302 by the end of August to make the arrangements. We were impressed with the quality, quantity and size of their stock. Some of the larger trees were spectacular and would create an instant impact anywhere. One of the most beautiful features of the West End is the canopy of trees that still line some of our streets. Many neighbors have agreed that it is one of the most important features that attracted them to the neighborhood in the first place and are willing to take action to preserve it. Unfortunately, time has taken its toll and recent storms have accelerated the decline of our trees. The goals of the fall planting project are to: replace the many trees lost over the years; maintain the green canopy; increase the diversity of trees; and include some native species in support of the Audubon Bird Town initiative. We hope to promote several group plantings in the course of the next several years. The summer months were busy as we researched and learned more about planting trees in urban areas. We were disappointed with the news that we did not receive a TreeVitalize grant this year. In order to move forward, we identified a tree nursery that is working with us to help us achieve our goals by providing a volume discount on trees. In addition, we had twelve volunteers work with us to do an inventory of the trees in the neighborhood that will provide guidance about what to plant along the streets. We measured the width of the verge and the diameter of the trees at breast height, noted utility lines that restrict planting options, and identified existing trees. The process confirmed that some areas are desperately in need of reforestation. The individuals who expressed interest in planting trees earlier this spring were invited to a meeting in late July to be introduced to David Walker and to discuss the process. Many have already signed up for a landscape consultation. The Walker's Tree Farm of Lehighton, PA, is a family run business established in 1925 with over 100 acres of trees. If you are not sure what to plant and would like some guidance, contact David Walker: (570) 657-6302. David has already set aside two days to be available in our area for consultations with home owners or home owners may visit the farm to select and tag a tree. Trees should be selected by the middle of September for fall planting or by February for a spring planting. Walker's may be able to assist homeowners in finding trees not currently available through Walker's Tree Farm. We have worked with the city to obtain recommendations about what to plant. The City has agreed to grant a group permit and waive the standard permit fee for each homeowner participating in this project. The City will also take care of the PA One-Call requirements to check for underground utilities prior to digging. The trees will be delivered and planted by David Walker and his crew as scheduled with the home owner beginning after the first frost. Aftercare for a newly planted tree is critical. The homeowner may opt to purchase a Gator Bag to assist with watering. What should I consider when planting a tree? Can I cut my sidewalk to allow more room for the tree? Yes. However, we recommend that you work with a professional. The American with Disabilities Act (ADA) requires that the remaining sidewalk be at least 36" wide. What can I do to minimize the root damage to the sidewalks? Plant a tree that is appropriate to the size of the verge. Where can I find the City's guidelines for planting trees? What is the required distance between a utility pole and the site to plant a new tree? What kind of trees should we consider planting under electric power lines? The National Arbor Day website and PPL recommend that homeowners plant trees that will grow no taller than 30 feet. Some recommended species include: Amur Maples, several varieties of cherry trees, Hackberries, Serviceberries, and others. Where can I find a source to learn about trees and help me decide what I want to plant? We are fortunate to live in this corner of the Lehigh Valley because there are three locations within walking distance where we can go look at trees. Muhlenberg College recently labeled all of the trees on their campus. 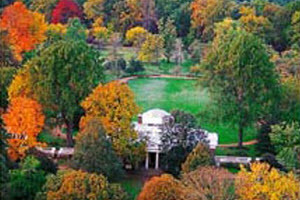 Take a stroll and observe where they planted Sugar Maples, Red Maples, Honey Locusts, Sycamores and Elms. 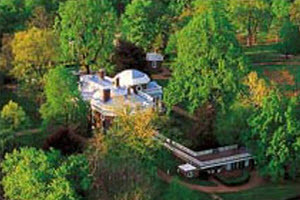 Cedar Crest College offers the William F. Curtis Arboretum, where you will find 36 magnificent labeled specimens, as well as other labeled trees that are not part of the arboretum collection. You can also observe and study their placement and use in the landscape. Stop at one of the main buildings to ask for a brochure to guide you. (I got mine in the library.) For more information see: http://www.cedarcrest.edu/ca/arboretum/index.shtm. The third option is West Park, on Linden Street between 16th and 17th streets, the place where children, for years, have gone to collect leaves for school projects. Approximately 30 RGNA neighbors attended a meeting at the Masonic Temple on March 22nd to learn more about what we can do to revitalize the 100 year old trees that have graced our West End streets and added so much beauty to our lives. The October snow storm took quite a toll on the neighborhood and it is sad to hear the chain saws and watch the trees being taken down as a result. This meeting at the Masonic Temple was the result of a discussion started at a Park and Garden Committee meeting to understand what, if anything, could be done--potentially in partnership with the city--to support an effort to replace the many trees that have come down recently. The RGNA Steering Committee agreed that this should be a top priority for RGNA this year. We are pleased to report that many meeting attendees expressed interest in helping to revitalize the tree canopy that initially attracted so many of us to this neighborhood. And now the work begins! What is the RGNA Tree Project? This is a new initiative and is in the formative stages. It is being developed by neighbors who have volunteered to work with the Department of Parks and Recreation to identify actions we can take to revitalize the trees in the neighborhood. There is one option available to us now and two other options currently under exploration with the city to present to RGNA neighbors. Option 1 (Currently available): Work individually with the city in choosing a street tree for your property: Choose a tree from the City's approved City Street Tree List (also available from the City's Shade Tree Commission at the Parks & Recreation office building). You'll need to get the City's approval for your tree selection and planting site before the City will issue you a planting permit, which you need to have signed by the City before you can plant your tree. Purchase the tree from a nursery and either plant it or pay someone to plant it on your property. Option 2 (In the information gathering stage): The city has offered us the option of working together with their assistance to plant between 30 – 40 trees along city streets. If the city purchases the trees, we benefit from a volume discount on the trees and the materials needed to plant a tree. RGNA needs to solicit interest, select the trees and be available to work with the city employees on the day of the planting. The city will purchase the trees that are selected by neighbors; will dig the holes for planting along the streets; and will supply mulch and staking materials as needed. Several days before a targeted date, the city employees will dig the holes. On the selected date the city will deliver the trees to the planting site. This is when RGNA neighbors get involved - we need to be present and take on the responsibility of finishing the planting and then maintain proper care for the tree. We also need 8 - 10 volunteers to work with the city employees the day of planting to assist with the distribution and delivery of trees and materials. The trees provided will be 2.5 - 3 inch caliper (10 to 12 feet). With a volume purchase and assistance from the city we estimate the cost to the homeowner will be approximately $250 per planted tree (depending on the tree selected by the home owner). We (RGNA) need to define a process to collect information and place an order with the city and a process to collect the payments for the trees. When we have sufficient interest, we will select a planting date. Option 3 (Also in the information gathering stage): There are grants available for obtaining trees for neighborhoods that would not require a cash outlay on our part. The city would obtain the trees, and deliver and plant them at no cost to individual homeowners. However, we do need to participate in the solicitation process and, more importantly, to be eligible for these types of grants, RGNA would need to show in the grant that we have recruited 8 - 10 volunteers to become "tree tenders," who would agree to participate in a training program about planting and caring for trees. Grants are subject to the approval of other organizations and there is no guarantee that we will receive one. However, RGNA will continue to explore that option. This is just the beginning. We need a small core group of organizers and we need to identify areas of focus for a pilot project to plant between 30 to 40 trees in the near future. I expect that we will hear from other neighbors who didn't return the form immediately after the meeting. From the addresses of the first ten (10) respondents, the initial areas could include: Gordon, 31st, Arch and Chew Streets. The project, however, is not limited to these areas. If you have not signed up, please consider doing so now by calling Becky Bowen at 610.434.4396 or e-mailing: jbbowen@enter.net. We have demonstrated to the City that we can generate a group interested in planting at least 40 - 50 trees and are now working on establishing a planting date for early Fall. We can still use volunteers to define and shape the program and to make it a reality. The RGNA Steering and Park and Garden Committees feel strongly that this is truly a universal benefit to the West End. As this is our neighborhood, we strongly urge you to work together with us, neighborhood-wise, to achieve this goal. Please stay tuned for more information as well, to be posted on the RGNA Park and Garden page, including Tree Lists, Frequently Asked Questions (FAQs), contact information for the Park and Garden Committee and updates on the progress. Welcome to the inaugural West End Blogger entry and Happy New Year to the membership of RGNA. If you've been a member for awhile and have taken advantage of using or visiting the RGNA website in the past, you'll notice we've had a face lift. We're introducing a new site with an opportunity for new and more interactive experiences with our membership to help foster more frequent exchanges and participation in neighborhood activities, create an easier way to join and renew your membership and get to know your neighbors even better. We also decided to introduce a new communications vehicle, "The West End Blogger", to learn more about and from the people who reside in the West End. We will be looking for volunteer "bloggers" who are interested in sharing information about their professional expertise, home ownership experiences, and even hobbies once a month. Entries can be any length, so don't be shy and reach out to me, if you're interested! Because this is the first entry and we are in a new year, I am sharing my New Year's resolution with everyone. My main goal for 2012 is to "simplify my life." As generic as this resolution may sound, it can be fulfilled in myriad ways--which is good for me because I'm the type of gal who needs options. So, today, I'm sharing one of my strategies - simplying my life "virtually." I think you might find some of these ideas helpful, too. If you have been bombarded with catalogs, leading up to and even after the holidays have passed, there is a way to save a few trees, a few backs of the men and women who pick up our recycling bins, and a few minutes almost daily sifting through endless piles of junk . Visit "Catalog Choice" (www.catalogchoice.org). It's a free service that helps you opt out of catalogs, coupons, credit card offers, phone books, circulars and more. Do you find yourself scrambling to find out when a loved one's flight is arriving or departing? Like me, you always question whether you really should get in the car to go to the airport. Visit www.flightaware.com or download their mobile app. FlightAware was the first company to offer free flight tracking services for both private and commercial air traffic in the United States and currently provides private aviation flight tracking in over forty countries. Looking to make a reservation at a restaurant and tired of searching for the number or waiting until they open to speak with the hostess? Make your own reservations at dozens of restaurants both locally and all over the country. My husband and I booked every restaurant on our last two vacations (Louisiana, Georgia, DC and Virginia) almost two months in advance without ever picking up the phone. Visit www.opentable.com. They also have a great mobile app for smartphones, iPads and other devices. Of course, we can't leave out shopping. If you can't find the time to make it to the mall or your favorite boutique. If you're a savvy shopper, know all your sizes and household needs I'll offer three sites of interest. Let's start with high-end designers from toys to shoes to chandeliers. Check out www.gilt.com. This site was started by two gals in the fashion industry. They offer daily, short-term sales on items often created as "samples" presented to retailers at their "buying" times. The samples not kept by retailers are sold at up to 70% off on this site and they have beautiful things. If you are loyal to retailers and brands and sign up for multiple email lists so you won't miss a sale, you should visit www.shopittome.com. This site is great. Create a profile that includes all your sizes and the sizes of all of your family members, too. Select your favorite retailers and brands and they will send you every item that's on sale and meets your criteria via one e-mail. You can even control the frequency in which you receive them. The ultimate personal shopper/sales clerk that doesn't follow you around the store or sneak up on you in the dressing room! Finally in the sale cateogry, one of Oprah's favorites--sorry, you won't find it under your chair, but you can find it on the internet. Go to www.onekingslane.com for up to 80% off furniture, antiques, home goods, designer and handmade rugs, original art and prints, small gifts, faux and dried florals, holiday decorating ideas and more. They work directly with interior designers and manufacturers to create these one-of-a-kind sale experiences. This site is fun. It operates the same way as Gilt.com. Sales are short, so you have to act fast and items move very quickly. OK! So I'm feeling like I've accomplished a little something already, but I have so much more to do. In the meantime, closets, basements, cabinets and shelves are calling my name, begging to be thinned and I'm dreaming of sunshine and lazy, long afternoons just breathing in the fresh air. Happy New Year West End!